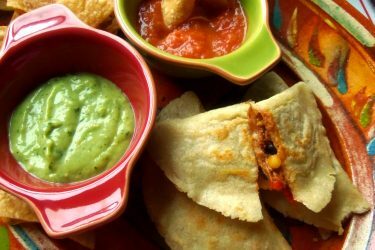 These dessert empanadas are to die for! 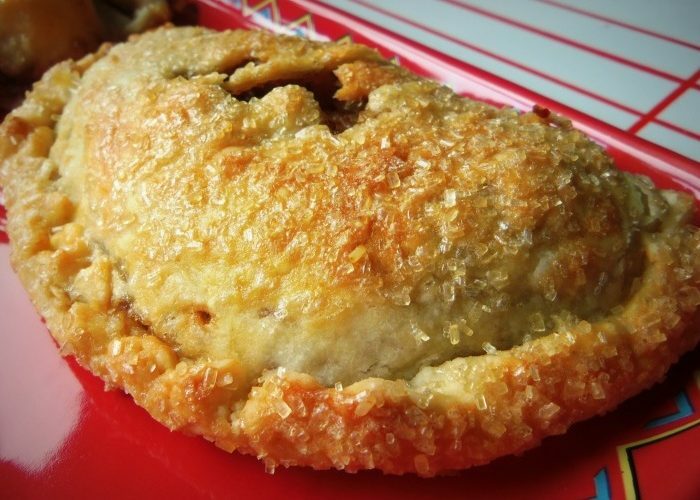 The flaky crust filled with salted dulce de leche and spiced apple is sweet and savory and yummy. A popular trend for a while now is salted caramels as well as salted chocolates. Why not salted dulce de leche caramel? Combine that with apple empanadas, and you've got an absolutely delicious dessert. I have my family’s empanada dough recipe that I love so much, but wanted to challenge myself and try making pie dough for the very first time. I found a basic pie crust recipe on Pinterest that sounded pretty simple. It was a little tougher to work with than my empanada dough, but the results were an extra flaky dough. You will have extra apple filling and caramel sauce left over. 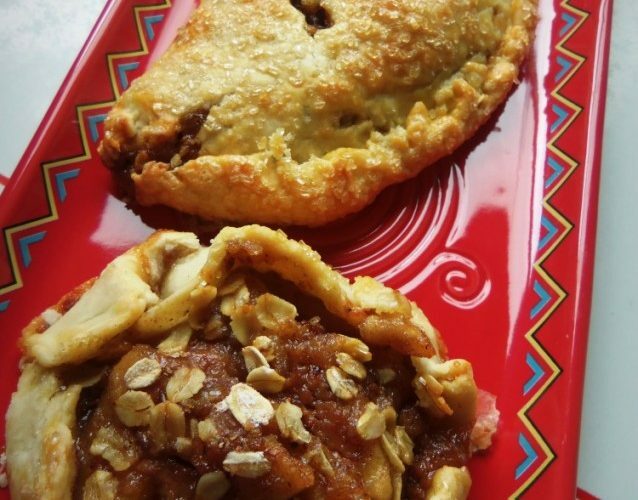 You could freeze the apple filling or you could top the warm empanadas with them, along with a scoop of vanilla ice cream… or you could double the dough recipe and make twice as many. In the food processor, add the flour, sugar and salt. Pulse a few times just to mix. Add half of the butter and pulse a couple more times. Add the other half of butter, pulse once again. Drizzle in the ice water and pulse until mixed but do not over mix. Pour dough out onto flat surface and work with hands until dough forms. Cover with plastic wrap and chill until ready to use. For the filling, in a large skillet, add the apples, butter and brown sugar. Heat to medium heat and cook until apples start to soften. Add all of the spices and continue cooking for another 5 to 7 minutes or until the sauce reduces and becomes thick. Remove from heat and set aside. In a glass bowl, combine the dulce de leche, butter and milk. Microwave for 30 seconds, remove from oven and stir well. Add in the salt, stir and cook for another 20 seconds, stirring in between until it’s smooth and well incorporated. Taste for salt, adjust seasoning if needed. Preheat oven to 375ºF. Line two baking sheets with parchment paper, set aside. On a lightly floured surface, roll out the pie dough to about 1/4 inch thickness. Using a round cookie cutter or a glass, cut out 4-inch circles. Fill one half with a couple tablespoons of apple filling and 1 tablespoon of salted caramel. Fold over and pinch edges to seal or use a fork. Transfer to baking sheets. 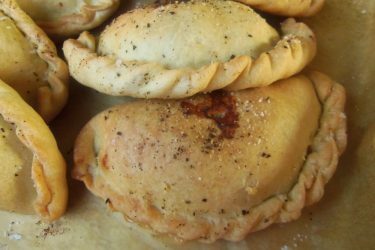 Once all filled, brush the empanadas with eggwash and sprinkle with turbinado sugar. 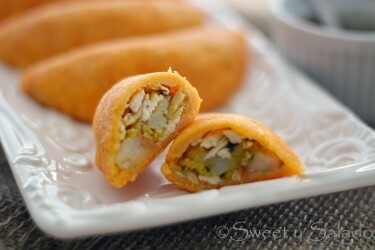 Take a sharp knife and cut a couple small slits on top of empanadas. Bake for 25 to 30 minutes or until golden brown. Remove from oven and let stand for 5 minutes. Drizzle with extra salted caramel sauce before serving.